Why are my gums receding and what can I do about it? Receeding gums can be scary, even uncomfortable. It is important to know that there are a number of factors that can cause your gums to recede. Let's try to understand why it happens and what you can do about it. The old adage "getting long in the tooth" — gum recession — is not inevitable. In fact it is a clear indication of current or prior periodontal (gum) disease ("peri" – around; "odont" – tooth). Teeth are designed to last a lifetime and despite the vicissitudes of wear, tear and tooth decay, with attention to proper oral hygiene, diet and dental care — they should. Let's start with what's normal. In a healthy situation teeth erupt into the mouth with the roots fully centered in, and surrounded by jawbone. The gum tissues behave almost like an investing curtain covering the bone; they surround the necks of the teeth like the collar of a turtleneck sweater. In addition to periodontal disease caused by dental (bacterial) plaque, the three most common factors that contribute to gum recession are: the position of your teeth, your genetics, and trauma. Tooth Position. If instead of erupting in the center of the protective bony housing, a tooth erupts outside of it, this can result in exposure of the tooth root. Thin or non-existent bone results in thin or no gum tissue. This is an important consideration for orthodontic tooth movement ("ortho" – to straighten; "dont" – tooth). During orthodontic treatment, if tooth roots are moved outside the bony housing, gum recession is likely to follow. On the other hand, if they are moved further within the bone, gum tissues are likely to get thicker and more resistant to recession. Genetics. Something else you can blame your parents for is your biotype, the genetically inherited characteristics that identify you. Some people are born with an inherently thicker type of gum tissue; on the other end of the spectrum, others have very thin tissues. As with the curtain analogy, a thicker gum tissue type tends to be more robust and resistant and a thinner type more prone to wear and tear — which manifests as gum recession. There is another factor to consider: the zone of gum tissue referred to dentally as attached gingiva or gum tissue. This is a band of tissue that surrounds and is tightly attached to the necks of the teeth. It is supported by the underlying bone, which also maintains its height. This zone or band of attached gum tissue serves an important protective function; it is designed to resist abrasion. If the zone is too thin it will not only be easily compromised by trauma, but also by periodontal disease, both of which contribute to gum recession. Trauma. Your oral health's best friends can also be its worst enemies — your toothbrush and floss. More often than not, gum recession is caused or aggravated by brushing and flossing too aggressively. 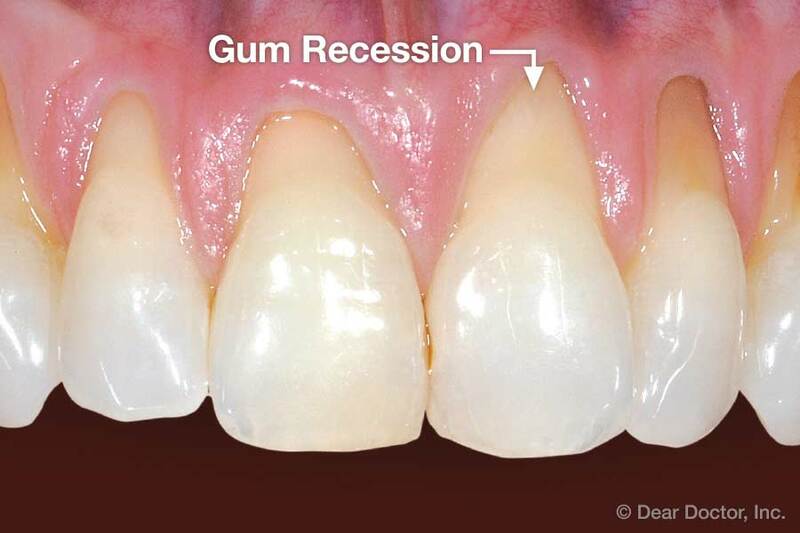 Overzealous use of either (in force and/or frequency) can traumatize, inflame and tear gum tissues resulting in recession. Excessive brushing can also cause wear to exposed root surfaces. The tooth roots, composed of dentin, are inherently softer and less abrasion-resistant than the enamel crowns of the teeth. Proper assessment and diagnosis requires a full medical and dental history, and clinical examination to determine why the problem is occurring and what needs to be done to minimize and treat your gum recession. If your gum tissues bleed, hurt or are sensitive, you either have gum disease or you're being too aggressive — see your dentist or periodontist if you experience either. Avoiding trauma and maintaining health of your gums often involves simple secrets: be gentle, brush no more than twice a day using a soft multi-tufted toothbrush, and floss once daily; clean the gum line gently — it doesn't take force to remove bacterial plaque. If you have gum recession your dentist or periodontist may recommend more effective methods of oral hygiene, orthodontic tooth movement to reposition teeth within their bony housing, or minimally invasive surgical procedures to enhance the quality and quantity of your gum tissue. Don't delay, there's really no reason to grow long in the tooth!